We’re a bit short on knitting content here, gentle reader, so I am distracting you with offering instead this little bit of yarn pr0n. 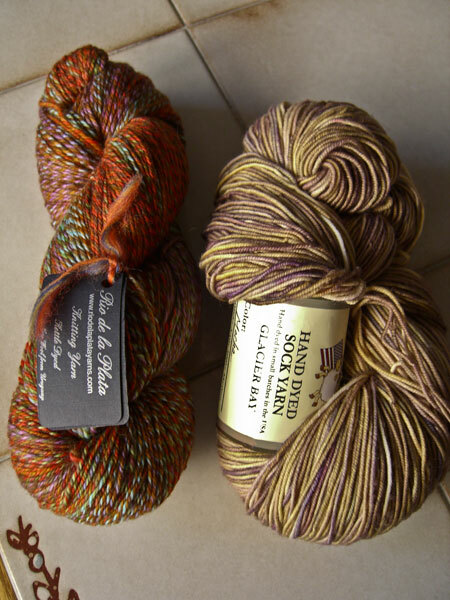 To the left is Rio de la Plata Multicolor Sock in SP35. The label specifies this colorway as being a combination of Cappuccino, Iguana, Sudan Brown, Sparkling Grape, Sky Blue and Red Orange. It’s 437 yds of 100% Merino superwash. I blame ~Kristie for this one. After seeing this yarn on her blog, I just had to have some. Mine came from The Loopy Ewe. To the right is Pagewood Farm Glacier Bay Hand Dyed Sock Yarn in Mocha. It’s 450 yards of 100% Merino superwash, and I have no one to blame for this one but myself. I saw it hanging on the rack in All About Yarn when my current class started, and I knew immediately it was coming home with me. Although it’s called Mocha, there is definite hints of grapiness. Love it! On a different subject, you know how you have that nameless, ball-bandless hank of yarn in the bottom of your knitting basket that you don’t have enough of and you really like but you can’t remember what it was so you can’t get more of it? Fess up, now. We all have one or two hanging around. I use mine for test swatches, because otherwise there’s not enough for anything else. I wish I could get more. But no idea what it is. A bunch of us were talking the other day about how nice it would be if there were someplace like the County Extension Agency, only for yarn. If a strange weed that you don’t recognize pops up in your yard, or an odd bug crawls into your house and you don’t know if you should be worried or not, you can take the thing over to the Extension Agency and they can identify it and tell you what to do about it (if anything). Why isn’t there a place where I can take my unknown yarn? I picture being able to bring in an unknown skein. A Master Yarn Identifier would look at it closely – maybe with a magnifying glass. Perhaps there would be comparisons made to a vast array of sample yarns. And after due consideration my unknown would be handed back to me and the Master Yarn Identifier would say Oh yes. That’s Koigu KPPM in colorway 5290, dyelot ABC. [ed. is dyelot too much to ask?] That yarn was produced in 2004. Don’t see much of it any more. Have a nice day. I know I’m dreaming. But wouldn’t that be nice?